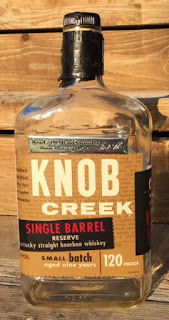 As I've said over and over again, the Knob Creek private selections, wherever they may be found, are one of the best deals out there. You're almost guaranteed to get a very good bottle of bourbon out of it, and sometimes you get something great. Either way, at $40.00 or less, at the very least you won't be stuck with buyer's remorse. Plus, no two barrels are alike, and I've really enjoyed just trying the different flavor profiles. Binny's recently got a new batch of private selections in. Many people immediately went for the 13 1/2 year old, the oldest among their selections, but I was informed that Binny's main buyer, whoever he may be, liked this barrel the best. Perhaps I was fed a line, or perhaps it's true, but again, at $40, what's the risk? So I grabbed a bottle to find out. The nose rich and heavy with the traditional vanilla and caramel notes. It has a mild alcohol burn, certainly less than would be expected from a high proofer. The nose is pungent, and it seems to forecast a heavy, rich and sweet flavored bourbon to follow. On first sip, flavors aside, my primary thought was, "This is delicious!" Caramel is the foundation of this bourbon, providing a sweet, creamy flavor from beginning to end, with a nice cinnamon spice at the end. However, from front to back there were other flavors that seemed to come and go, not sticking around too long to offend the senses or to detract too much from that base-line caramel, but rather only long enough to make you appreciate those flavors while they're there, and love the caramel notes when they're not. There was a anise flavor that I noticed in early pours. Again, though, it wasn't prevalent throughout, but just seemed to come and go, having me looking for it. It may seem weird, but this combination, with the heavy caramel and cinnamon finished reminded me of cinnamon roles. On later pours, that anise flavor took on more of an amaretto flavor which, mixed with the caramel took on a very rich brown sugar syrup flavor. But, and possibly thanks to those amaretto and anise notes, this bourbon was never too sweet, and always had that tingly spice at the end. It also developed a light woody dryness to it towards the end that, again, kept it from being too sweet. This bourbon was very rich, oily in texture and creamy in character. It had a lot going on, with different flavors coming in to play around with the caramel, but never upstaging it. 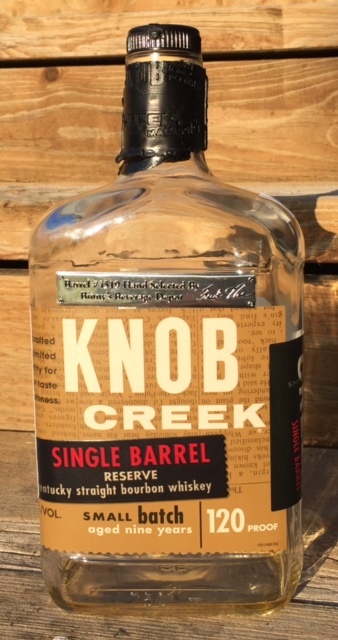 Whether or not this was truly the barrel that Binny's buyer liked best, I don't know, but I can certainly see why it would be his favorite. This was a great pour, and I already miss it!